The increase in the use of contactless on credit cards was even greater - with 44% more purchases of this kind in 2018 compared with the previous year. Eric Leenders, managing director of personal finance at UK Finance, said: "Many of us are now reaching for our cards or mobiles rather than cash to make low-value purchases, as customers opt for the convenience and security of paying with contactless. 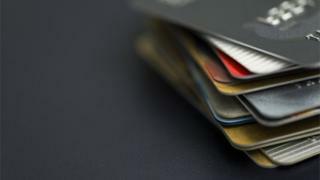 "There has also been an increase in credit card use although growth in outstanding balances has slowed, suggesting many consumers are using their cards for day-to-day spending rather than as a means of borrowing." Cash or no cash - where do you stand?